Tom: ‘Premonition 18’, at nearly 30 minutes, takes a while to get going. By half way, there’s greater momentum with circling synth arpeggios. Its end section, from c.23:00, has improvisatory synth emissions and the glug-glug-glug of pulsing bass. In its title, ‘People Tree’ evokes the saccharine Newley-Bricusse showtune (covered by Sammy Davis Jr.). I don’t find this the most enthralling of the LPD’s more abstract tracks. It doesn’t really conjure distinct spaces or places; but does work in rebuking counterpoint to the aforementioned showtune. This sort of long-form territory has been better navigated by Nurse with Wound in releases such as The Sylvie And Babs Hi-Fi Companion (1985) and Spiral Insana (1986). The former has an ingenious use of dubious samples, e.g. Charlie Drake’s ‘My Boomerang Won’t Come Back’, and the latter has a mysterious gravitas and inexorability about it. 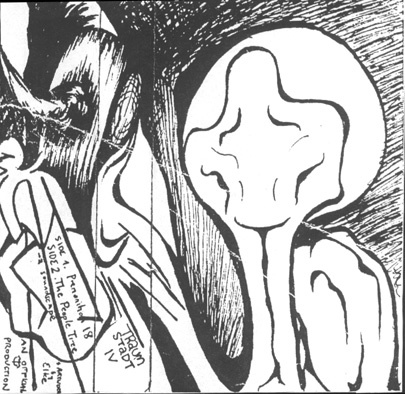 Inner cassette art from the original release. Adam: I agree with Tom. 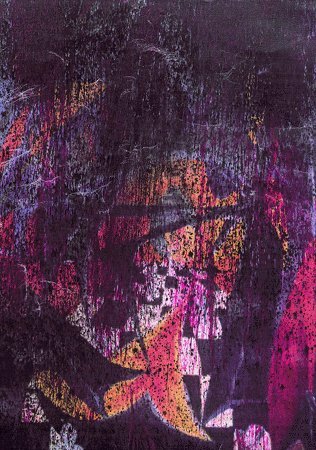 ‘Premonition 18’ sounds like noodling that never becomes jamming. It could be used as interval music for a Bauhaus concert. I feel like there are methods of listening that could make it more exciting. Trapped in a coffin. During an MRI scan. In the middle of a stone circle. While pressing drawing pins slowly into your toes. But – in truth – the music never sounds particularly interested in being listened to and so you never feel particularly interested in listening to it. In fact, at 11:00 minutes in ‘Premonition 18’ could almost be mistaken for the humming of my computer and the sound of people moving metal objects about downstairs. Retrofuturist cyberpunk dystopia perhaps, but a very banal, workaday one. If you imagine watching David Lynch’s Eraserhead (1977) while slightly depressed, that’s just about the overall effect. There’s some nifty Snakefinger-style guitar disfiguration later in the track but it’s all too little too late and I think we’ve (literally) heard it before. As an early ’80s effort in tape manipulation it would already have been a curate’s egg, listlessly scrambled and spread thinly on toast; at this point in the Dots journey, such a release runs the risk of seeming indulgent. Alternative cover art for CD re-release. Inertia weighs less heavily upon the evocatively-titled ‘People Tree’. While any semblance of melody, harmony or rhythm takes a while to emerge, the soundscape of ghosts, trains and electricity is evocative enough with one’s eyes closed. However, less auspiciously, at 6:30 a hideous chirruping of robotic clowns seems to begin… which at 8:50 start playing toy accordions… and then the MIDI cats start singing!… This ludicrous cacophony ceases pretty abruptly at the 9:24 mark and ‘People Tree’ becomes an enjoyable stormy tone piece with atmospheric excerpts from Asylum‘s (1985) ‘This Could Be The End’ and Island of Jewels‘ (1986) haunting ‘The Shock of Contact’. 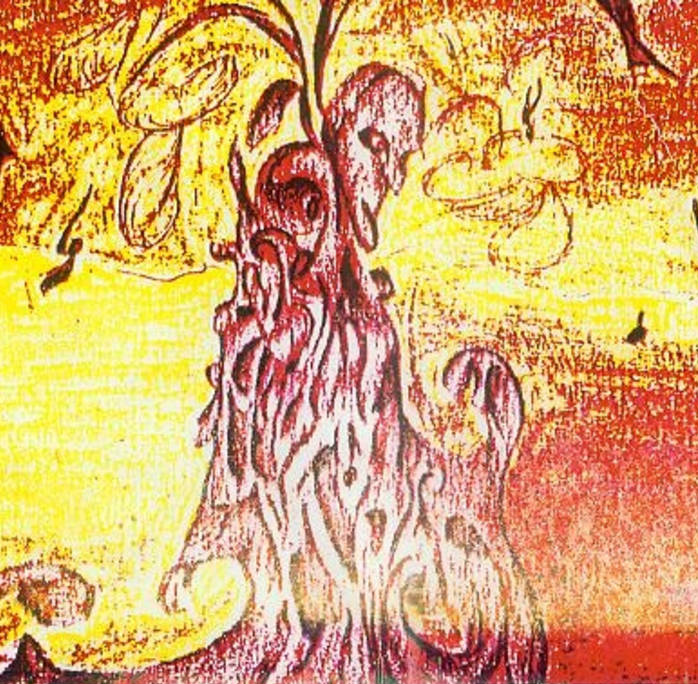 I’m marginally annoyed that I did not come across ‘People Tree’ earlier since for my student radio show I narrated a monologue from the POV of Charon, the ferryman of Hades, over the top of ‘This Could Be The End’ and I had to rush it a little knowing that Edward’s vocals were going to kick in! Hindsight is as wonderful as a bit of nectarine skin stuck between your two front teeth (this always happens when I eat nectarines). Tom: ‘The Lifesucker’ is a lengthy, woozy take on vampirism. It has a long, violin-led instrumental section, with Patrick Q. Wright leading the way. Next is the very late-1960s atmospheres of ‘Time Dance’. “Busy streets with crazy shoppers” – delirious, upended imagery. We have sublime guitars and lilting violin, and the personification of “lonely bridges”. It moves into an even more tranquil ambient section. ‘Even Now’ discusses mistakes being made and “bandages” – perhaps not ideally for someone having undergone surgery! We have doomy, melodramatic imperatives “feel the stethoscope pressed down, even now!” “Start with flowers and a row, even now”. The addressed protagonist won’t settle down; they’re far from ready. We’re then thrust back into ‘Time Dance, Part 2’. There’s a surreal imagery here, “walls of windows”, though the track’s mix feels like it’s going to ebb away at any time. “Beacons for a passing ship […] Slipped into the water” – it’s an Ophelia scenario, which aptly enough just slips away before its time. ‘Mmmmmmmmmmm…’ has brisker, wilder music than before on this album. “It’s neat to be a carnivore” – we have heard this before. ‘Flesh Parade’ dramatic, frenetic stuff – not music to fall asleep to! Or is this ‘Purity’, with its images of “Piston legs” and “accompanied by a lullaby, hysterical laughter”? There are more Ka-Spel jabs at the absurdity of seeking purity in any sense. ‘IIt’ is another familiar track; previously having appeared on Prayer for Aradia (1985). I don’t have too much to add, other than that its sardonic attack on commodification and objectification is all the more pertinent in this now post-Weinstein, #MeToo era. 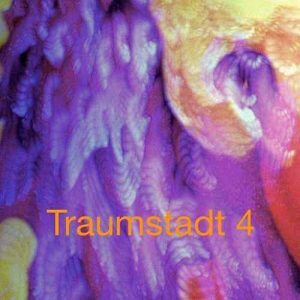 ‘Traumstadt 5’ alternative CD re-release cover. ‘The Heretic’ appears for the third time in the LPD story, rearing its head again like a Jacob Marley door knocker. ‘Government Health Warning’ is, not in fact, the mid-80s Christmas tune but a distantly mixed continuation of ‘The Heretic’, further questioning just who is the “lunatic”. Now that original ‘Government Health Warning’ track is a triumph of ‘festive’ brevity: 85 seconds of densely ordered discomfit and phased merriment. It was one of the first early Dots tracks I ever heard, and stands as something of an obscure Christmas favourite. 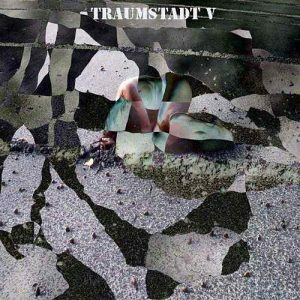 The procession is bacchanalian: “They followed stars and drank in bars and wrapped themselves round lampposts / As the posters whispered: ‘THINK BEFORE YOU DRINK’ – they didn’t!” The music is pristine, relatively straightforward synthpop. Ka-Spel’s toast “It’s Cwwwwwistmass! Happy birthday, Christ!” is nothing short of tremendous. Shame that this true ‘GHW’ is not on this release! The bleak, dark ‘The Divorce’ has dank and distant church bells, followed presently by wheezing asthmatic blocks of synth. It’s suitably deathly, with the inference that we have to believe in love. ‘Ice Baby Cometh’ is a Lynchian take on the perils and fears inherent to parenthood: “while mummy’s screaming for the morphine”. A sped-up recording of the synth part recurs in the longer instrumental section that takes up most of the four minutes. ‘Boule (Vien Ici)’ continues this release’s quiet, somewhat lo-fi, even ill-mixed, production. It passes almost imperceptibly; circa 2:35, a bleepy, slightly more tangible instrumental emerges. We have vocoder too, but words aren’t to be made out. It is akin to a more low-key take on the lo-fi primitivism of certain tracks on Chemical Playschool 1 & 2 (1981). (EDIT: Dots experts Zébulon Tator and Dominic Audy have kindly informed me that ‘Boule (Vien Ici)’ is in fact a cover of an original single by French experimental electropop group Ptôse. ‘Boule (Vien Ici)’ was a minor hit and the band encouraged friends and those who had previously appeared on their label Ptôse Productions Présente to produce their own versions, which were compiled on their festive cassette mail-out Joyeux Noël. The contribution previously known by myself was this one by Renaldo and the Loaf, which appeared on their 1987 album The Elbow is Taboo). ‘Down from the Country’ we’d heard as far back as Kleine Krieg (1981), and its “No answer, answer, answer, answer” refrain was also present in this album’s ‘Ice Baby Cometh’. Here it is slightly less distinct; it is murkier, as if heard from another room. Again, we have sped-up keyboard descending into dankness. From around 5:00, we have the actual ‘Down from the Country’, with its protagonist dreaming of success but ending up a mere ‘city ghost’, full of burger and playing Space Invaders. In conclusion, there is too much repetition and too little unique material here for the confusing Traumstadt 5 to stake its claim as a memorable entry in the LPD oeuvre. I’ll give it some grudging respect for ‘Time Dance’, but only that. Adam: Traumstadt 5 is, as Tom has laid out, another odds-and-sods collection by the Dots of variable quality. It is also not currently available via the Dots’ Bandcamp page – however it is available in remastered form from iTunes. Several of the tracks here such as ‘Mmmmmmmmmmmmm’, ‘Heretic’, and ‘Down From the Country’ have – as said – already been covered and having moved onto later, more musically and thematically complex fare, it was a trifle wearying to revisit them here I found. ‘The Lifesucker’ is a typically opaque story of vampirism. It has a fuzzy pins-and-needles quality to its sound which reminds me appropriately of how my arm feels having donated blood. It’s slightly too sedate perhaps… I’d rather have had some gothic theatrics in place of the dainty piano melody that sets the tone of the piece. Wright’s violin then takes the reins for the rest of the 8:00 version here and on the 1997 Stained Glass Soma Fountains release in a simple rondo form with variations. It’s similar though not exactly the same as his work on Asylum‘s ‘The Last Straw’ and ‘Hotel Noir’ from The Golden Age (1989). I rather like ‘Timedance’ as it has that reverberant drop-D fingerstyle guitar sound I associate with the folk revival and Robin Hardy‘s The Wicker Man (1973) and its sun-drenched 1970s cinematography. 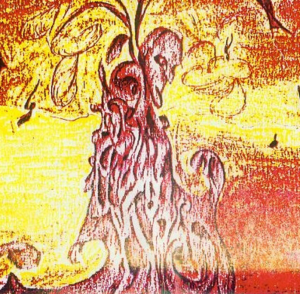 The Legendary Pink Dots are tangentially associated with neofolk/ darkwave contemporaries like Current 93 and Coil, but thankfully Ka-Spel’s politics have always seemed inclined towards the anarcho-socialist and his mysticism Kabbalic, rather than the far-right Nazi occultism indulged by the likes of Death in June or Blood Axis. ‘Even Now/Eventide’, which are bunched together on the iTunes release, borrows its melody from the “just we too/ I’ll melt with you” section of ‘Apocalypse Soon’ anthologised on both Traumstadt 2 and Chemical Playschool 3 & 4. There’s some neat little guitar pull-offs, but it’s a bit of an ambient wash-out. ‘Purity’ has a pleasingly clattered garage band sound to it, a nice contrast to the flattened sound of much of the album. It has some vim and vinegar to it! It reminded me unexpectedly of The Rolling Stones! ‘Boule (Viens Ici)’ sounds like very early Dots indeed and more of a half-formed demo than anything else. I do rather like how broken down the equipment producing the music sounds though! Again, not a substantial effort. ‘Ice Baby Cometh’ is stronger, with nice queasy undulating synths set to suggestive lyrics. It’s certainly one of the strongest tracks on the album, though can’t help but bring to mind even stronger similar fare like the sublimely haunting/troubling ‘Phallus Dei’ from all the way back on Chemical Playschool 1 & 2. Finally, the concluding untitled track is just an electronic orchestral swell… not much to say about it save for the dubious merit of having pointed me in the wrong direction to a different untitled Dots track from some forgotten compilation with a cover so pornographically obscene I was shocked it hadn’t been taken off Youtube!